He always talked because he saw discussion as the most worthy goal for art. Redestellen ist auch eine Kunstform. I have devoted my entire existence to spreading his Voice in the world. Arbor est secundum Heraclitum natura nostra quae se obducere atque abscondere. In her essay ‘Beuys’s Voice’, Lucrezia De Domizio Durini gathers and presents her concentrated thinking on the life of Joseph Beuys, on his work, on their collaboration and its consequences.1 The essay covers a period of over thirty years, a time period during which she has expressed herself as engaged in ‘militant cultural activity.’2 The essay ‘Beuys’s Voice’ is an indispensable document, setting down as it does a crucial and consistent interpretation of Beuys, an interpretation which involves deeds as much as words and commentary. Her various publications attest to the significance of all these ‘spirit guides ’in her own journey, with its implacable attestation to the power of love, the gift of memory to the other, the absolute necessity of creativity. To Harald Szeemann she dedicated the eventi collaterali of the 52nd Venice Biennale, the continuing of the permanent conference first initiated by Beuys at Documenta.6 Her core commitment helps one understand the beautiful phrase of the philosopher Boethius: ‘He will never go to heaven who is content to go alone’. As the author of the critique maintains, Beuys’s method is ‘to improve existing methods’, a view also expressed by Pierre Restany in an interview with Durini, going so far as to say that Beuys didn’t create new formal inventions, but was rather an engineer of the organic.16 The sandstone basins already carved as tubs from the quarries of Lettomanoppello, a town in the province of Pescara in the Abruzzo, which had been used to let olive oil settle, objects then of agricultural use, marked by time, could be spoken of in a certain sense, as ‘ready-mades’. However, Domizio-Durini insists that they are inspired by a different method to Duchamp. This question of the therapeutic is also of significance to understanding The End of the 20th Century. U We Claus reports in detail that when working on the basalt columns with Walter (a.k.a. Carl) Giskes, they had been guided as stonemasons by a word Beuys had written on a drawing in Kassel, where according to the publication of Veit Loers and Pia Witzmann. Throughout this account there are many overlapping strands. Principally one has to recall that not only did Italy become for Beuys a significant site of work and exploration, it was also there that he had presented F.I.U in 1978, which he refers to as a ‘phenomenologically open and tolerant alternative which sees a creative being in every man’.26 The date for this first presentation is established in the literature as the 12th of February 1978, in Pescara. This debate, which was the official presentation of the Free International University for Creativity and Interdisciplinary Research (FIUCIR), was organised by Lucrezia de Domizio Durini and held in the stock market of the Chamber of Commerce in Pescara. Part of Beuys’s revolutionary programme proceeded from his idea that it was necessary to free concepts from their ideological wrapping, and get ‘to their phenomenological nucleus’. He was convinced that an anthropological conception of art could not be developed in traditional institutions. His expanded conception of art required as its central idea that creativity is a fundamental spiritual principle. Property, ownership and wage dependency as the dominant ideology of production constitutes for Beuys the absolute ‘negative factor’ of work. He saw clearly that money which organises work has to undergo a transformation. In his terms he spoke of money becoming a juridical figure in such a way that it would be the elementary expression of democracy, and as a consequence the whole banking system would be transformed into a democratic legal figure. Money would not then be the real ‘creator’ of economy; instead, true capital would be art, which for Beuys means man’s creativity. Such a concrete capital is accompanied and not created by a juridical document. There can be little doubt about the Steinerian provenance of much of this thinking, certainly in its core analysis. Beuys also spoke with mantic precision. Speaking of the evident mineralisation and sterilisation of the earth which was a result of scientific-technological manipulation, he asked for a new energy where animals, plants and earth were not observed in mechanical terms, but ‘in the energy fields in which they live’, and what was required was instead an ‘implosive principle’ which takes account of all the energies, even those around the plant in cosmic extension. It is surely the latter implosive principle which was being variously explored by Beuys in the 7000 Oaks project, the sculpture The End of the 20th Century, and fully recuperated in the Paradise Plantation project, with which the life and work of Lucrezia de Domizio Durini will be forever associated. Such a conception of the axis mundi is essential to the implosive principle and cosmic extension of which Beuys had spoken; creating a genuine cosmography of nature. In an esoteric interpretation of this paradise, it is indeed the place which is the one right interpretation. From the story in the medieval compilation the Zohar, the word for paradise in Hebrew, pardes, was also taken as an acronym which represented the different reading available for the texts of the tradition, and thus Paradise was the sum of creative interpretations. The devotion of Lucrezia de Domizio Durini to this project is indeed the life of ‘the one right interpretation’, and from being the didaschos of Beuys, she is the protectress of Paradise. It is also coherent to understand this in a less esoteric and more pragmatic sense. Beuys had understood that the role of the F.I.U. was to gather and stimulate creative energies. He saw these works as paradigmatic, giving an example to the majority of minorities that one could develop models for the future of mankind. For Beuys the alternative was clear, it was a question of structuring life with something that is intrinsic, of transforming life into a work of art, into the expanded, broadened, conception of art, that looks ‘to each person and to his or her concept of work’. The fundamental issue was simply, could people come together in a democratic way to achieve self-determination for each one? … we should remember that planting an oak in Kassel means more than simply sponsoring a tree, it means having a different conception of life. In a simple analogy, one that is consequent with the first analogy between his own chaos and the work of sculpture he made during his ‘crisis’ in the 1950’s, Beuys draws attention to the tripartite human creativity that involves feeling, willing, thinking, and projects this analogically to the strata in the plant, of leaves, trunk, root. Essentially then in the planting of Paradise the process of the Defence of Nature would exhibit the epistemological and the anthropological, and also relations to the biosphere, ecology and society. Indeed the process of the planting would also exhibit how by the support it would engender the forms in which ‘social credit’ takes place, and through the imagination released in working the confrontation with a new reality takes place in the process. It is more than a mere question of working in the field of biology, or of taking care of living things, or, even of putting oneself at the service of life. Beuys states it starkly; it is a question of the saving of our souls. This was the goal he envisioned when we go to work planting trees. The objective for Beuys is freedom and self-determination as the general productivity of both the social and individual body. 1 Lucrezia De Domizio Durini, Joseph Beuys, Difesa Della Natura, The Living Sculpture, Kassel 1977 Venice 2007, A Tribute to Harald Szeemann, Silvana Editoriale, Milan, 2007. The First Reading within the publication is entitled ‘Beuys’s Voice’, and is by Lucrezia De Domizio Durini, pp. 24-60; all further reference to ‘Beuys’s Voice’ refers to this and will be cited by essay title and page number. The event hosted by the Spazio Thetis in Venice was conceived and curated by Baroness Lucrezia De Domizio Durini. The event was conceived as a comparative analysis 30 years on from Beuys’s 100 days at Documenta VI in Kassel, in the context of the organisation of the F.I.U. 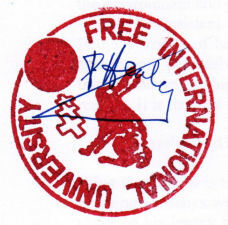 (Free international University), and took place during the 52nd Biennale, Venice. The antecedent creation of the Free College with Heinrich Böll in 1974, and Beuys’s discussion in Ireland to found the F.I.U., are reported in Götz Adriani, Winifried Konnertz, Karin Thomas, Joseph Beuys, Life and Works, at pp. 270-274; see note 11 below. Under the date of 1974 June 24-October 2, they give ‘Establishment of the “Free International College for Creativity and Interdisciplinary Research, Inc’. Note the use of the word ‘College’ in this title. In Pescara the acronym F.I.U. becomes publicly established. 2 This self description is best understood in the publication, Joseph Beuys, Sculptor of Souls, Olivestone, Silvana Editoriale, Milan, 2001; which tells of the extraordinary sequence of events connected with the destiny of the work Olivestone, especially the account from pp.171-183, given in the first person by Lucrezia De Domizio Durini. 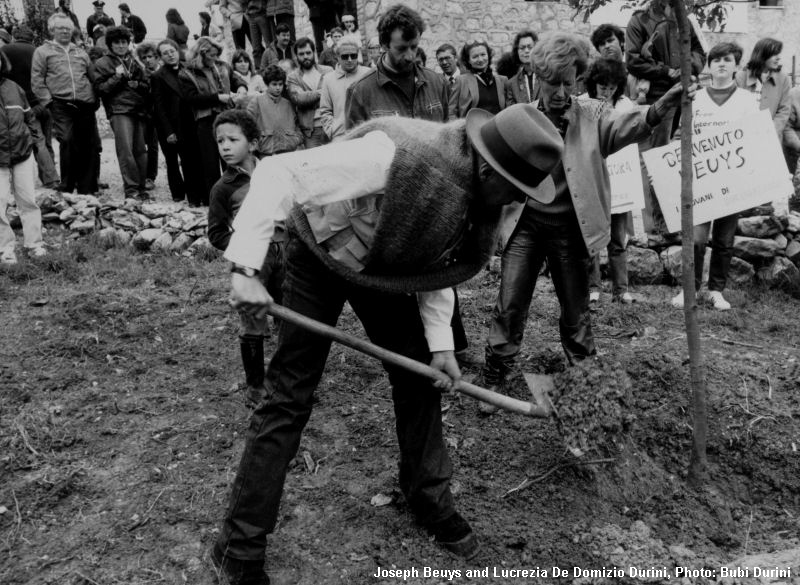 The work was published on the 80th anniversary of the birth of Joseph Beuys. A note in ‘Beuys’s Voice’ states that the work Olivestone was created for the F.i.a.c. Paris, 1984, October. On the occasion of the exhibition Ouverture inaugurated at the Castello di Rivoli, Turin, December 18th 1984; Lucrezia De Domizio Durini lent the work, reworked by the artist in five tubs. After a legal dispute that lasted eight years, the bona fide owner, Lucrezia De Domizio Durini, donated Olivestone to the Kunsthaus in Zürich on July 12, 1992. Olivestone was exhibited as the centrepiece of the 2001 Venice Biennale, by the director of the Biennale, Professor Harald Szeemann. Further information can be found in Lucrezia De Domizio Durini’s, Libro Bianco Olivestone, Carte Segrete, Rome and Kunsthaus, Zürich, 1992. 3 See note 1 above, ‘Beuys’s Voice’, p. 26. 4 ‘I have freed myself from the two great powers that exert undue influence on all human minds, Politicians and Churches. I have tried to be free outside the system’, ‘Beuys’s Voice’, p.27. 5 For Harald Szeemann, see, Lucrezia De Domizio Durini, Harald Szeemann, Il Pensatore Selvaggio, Silvana Editoriale, 2005. For Pierre Restany see her account in Pierre Restany, l’Eco del Futuro, Silvana Editoriale, Milan, 2005. Her biography and some of her more than 56 publications are given in the publication Joseph Beuys, Difesa Della Natura, see note 1 above, pp. 286-287. 6 See note 1 above, and her account of Harald Szeemann Il Pensatore Selvaggio, Silvana Editoriale, 2005. There Szeemann is described as a ‘visionary’ who exhibited the real force of intuitive energy and creativity in his capacity to ‘riunire uomini e donne per un obiettivo commune’, p. 22, 23. 11 Some of this is directly derived from Götz Adriani, Winifried Konnertz, Karin Thomas, Joseph Beuys, Life and Works, (translated Patricia Lech), Barron’s, New York, 1979; the original edition appeared in German in the DuMont Verlag, Cologne, 1973. 12 The separate publication, Joseph Beuys. Sculptor of Souls, Olivestone, Silvana Editoriale, Milan, 2001, contains her fullest account, and should be read in conjunction with the extra comments in Beuys’s Voice, pp. 28-34. This was the most sustained reading of any individual sculptural work of Beuys, until the recent appearance of the study on The End of the 20th Century, see note 21 below. 13 This is the interpretation of Lucrezia De Domizio Durini. 14 This can be followed in the working paper published by Johannes Stüttgen, on the 7,000 Eichen, see Johannes Stüttgen, Joseph Beuys 7000 Eichen, Ein Arbeitpapier der FREE INTERNATIONAL UNIVERSITY (fiu), Bielefeld, 1982. Stüttgen reproduces extracts from the Joseph Beuys/Bernhard Blume, ‘Gesprach über Bäume’, from 24th of April 1982, held in Magers gallery, Bonn, from the transcription made by Johannes Stüttgen, who acted as Beuys’s factotum. In the conversation one can note how Beuys wanted to demystify the recent Nazi usage of the tree for symbolic purpose, and referred to its symbolic meaning as indicating the difference between North and South Europe, effectively barbarism/culture, noting in passing that the word Druid meant oak: ‘Das Wort Druide heißt Eiche’. The specific choice of oak is precisely for its symbolic significance, Beuys remarking that he wouldn’t for example choose ‘robina pseudoaccacia’ whatever its age, as it lacked referent for his project. The symbolic replanting of the earth was in Beuys’s sense destined for Kassel. In the course of the conversation Beuys provided the slogan ‘Die Reine Vernunft ist grün’ (‘Pure Reason is Green’). Beuys’s equivalence of Druid and oak can be indicated from the etymology of the word Druid. Xavier Delamarre, in his Dictionnaire de la langue gauloise, offers important arguments. Pliny first proposed the sense of Druids as those with knowledge of trees, eichenkundig. He made the term druids cognate with drus for oak. This view of the ancients that there was a tree cult among the Druids supports the etymology of the word being derived from dru = ‘arbre, chêne’. The overwhelming linguistic evidence according to Delamarre is that dru-wids means ‘le connaiseur de l’arbre’. Delamarre wants to add that for such an important sacerdotal class, akin to the Indian Brahmins, the ‘knowers of the world tree’, Yggdrasill of the Scandinavians, skambha, pillar of the Vedas, should be considered. This suggestion is studied by W. Meid in, Festschrift Helmut Birkhan, Peter Lang, New York, Frankfurt, 1998. Also valuable is Emilia Masson, Le combat pour l’immortalité, Paris 1991. 15 Johannes Stüttgen, op cit., p.i. 16 This can be found in Lucrezia De Domizio Durini, Pierre Restany, l’Eco del Futuro, p.43: ‘Ma Beuys non ha inventata nessun sistema di linguaggio, nessun riferimento formale. Piu che un alchimista, piu che un profeta ispirato, va visto come un ingegnere del-l’organico’. (‘Beuys hasn’t invented a new linguistic system, or formal reference. More than an alchemist, more than an inspired prophet, he should be seen as an engineer of the organic’). 21 The most detailed study of theurgy can be found in the writings of Iamblichus. 22 This reference is cited in the recent publication, Joseph Beuys Das Ende des 20. Jahrhunderts, Doerner Institut, Munich, 2007, p.65. 23 ibid., pp.121-137. U We Claus in his personal testimony provided invaluable insight into the thinking and making of the work. The link with Stonehenge and the Druids awaits exploration. The Friedrich painting of the geomorphological as a ruin might suggest that Beuys has installed the ruin of a ruin, a fallen Stonehenge. It also possibly commemorates the fallen of various wars, and belongs to the Ruinanz of German and therefore world history in the 20th century. 25 For the early drawings of Beuys one should consult, Joseph Beuys, Kleine Zeichnungen, Museum Schloß Moyland, 1995. 26 This phrase can be found in the transcription of Beuys’s contribution in Lucrezia De Domizio Durini’s second reading, in the publication Joseph Beuys, Difesa Della Natura, see note 1 above, during his presentation of the F.I.U. in Italy, pp.62-89. 27 The addresses and articles by Rudolf Steiner from which I take these points were translated into English by E. Bowen Wedgwood, and distributed to members of the Anthroposophical Society by permission of Mme. Marie Steiner, under the title The Threefold Order of the Body Social, as a three part Study Series, with no date or place of publication. 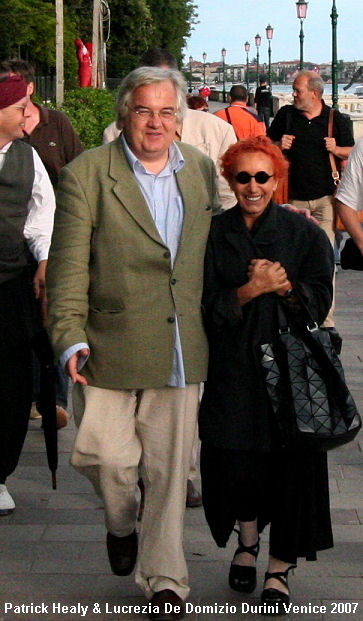 28 Martin Heidegger, Besinnung, Vittorio Klostermann, Frankfurt am Main, 1997. 30 D’Avosso’s writings have been the principal critical reception of the work of Beuys in Italian. 31 For this discussion see Bruce Lincoln, ‘The House of Clay’, Indo-Iranian Journal, vol. 24, no 1, January 1982, pp.1-12. 32 The text on the ‘third way’ has been reprinted as part of the Eventi Collaterali of the 52nd Venice Biennale. 36 As quoted in Joseph Beuys, p. 98, see note 1 above.